Bryan Currently living in Cincinnati, OH with his wife (and fellow author Brandy Michelle) and their daughter. Bryan W. Dull goes leaps and bounds to get away from the norm and be his own person; with himself and his writing. Since middle school he has always known what he was good at: entertaining and telling stories. He has been consistently writing and coming up with plots for the last twenty years, but just recently decided to share one with the world. 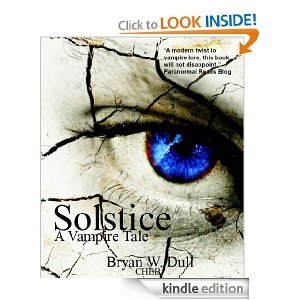 His first novel, “Solstice” is a vampire book inspired by his daughter and noir literature. Born in Anderson, IN, Bryan has also lived in Ohio, Florida, North Carolina and South Carolina (where “Solstice” is based).